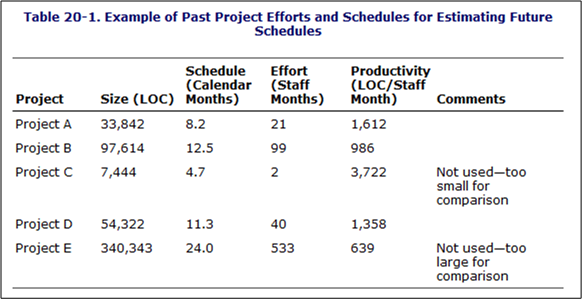 Of course, in order to use the equation to compute a guesstimate, as the table below shows, you must have tracked and recorded past efforts along with the calendar times it took to get those jobs completed. Of course, not many orgs keep a running tab of past projects in an integrated, simple to use, easily accessible form like the above table, or do they? The info may actually be available someplace in the corpo data dungeon, but it’s likely fragmented, scattered, and buried within all kinds of different and incompatible financial forms and Microsoft project files. Why is this the case? Because it’s a management task and thus, no one’s responsible for doing it. In elegant corpo-speak, managers are responsible for “getting work done through others“. The catch phrase used to be “getting work done“, but to remove all ambiguity and increase clarity, the “through others” was cleverly or unconsciously tacked on. How about you? How do you guesstimate effort and schedule?